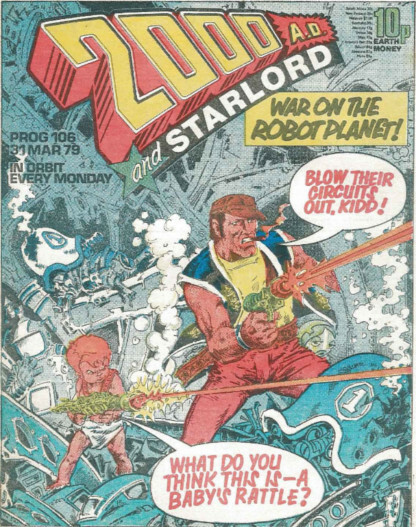 I’m reading back issues of an ancient comic book that I first read, long ago, when I was a kid. A big part of the reason I’m doing it is nostalgia, and this issue comes with a big hit of that. 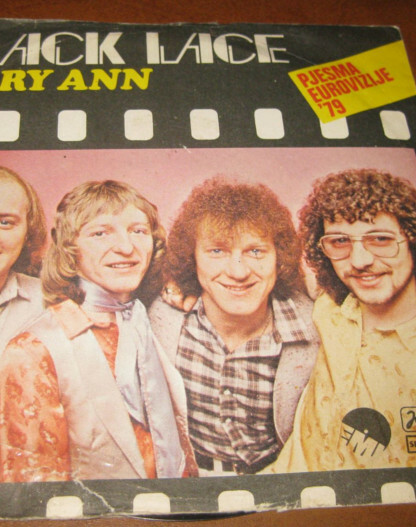 That’s because this issue, issue 106, was published on 31 March 1979, which was the date of the 24th edition of the annual Eurovision Song Contest, and that is high-power nostalgia for a kid growing up in the UK in those dark days. The Eurovision Song Contest was huge in the 1970s, and I used to really enjoy watching it. These were the days, unlike now, when the UK used to do well. From the late 60s to the late 70s, the UK placed almost each year in the top four. Entrants, like Cliff Richard, Lulu, and Olivia Newton-John, were household names. Back then, Eurovision meant Terry Wogan. Wogan commentated on the show for the BBC for more than 30 years. His jokes were repetitive, and his targets easy (based on the slightly ridiculous tradition of the song contest) but it felt benign. This 24th Eurovision was the first Eurovision since 1972 in which Terry Wogan did not provide either the television or radio commentary. Wogan had originally been scheduled to provide the television commentary but opted out of going to Israel following comments he made of the 1978 winner "A-Ba-Ni-Bi" sounding like "I Wanna Be a Polar Bear." 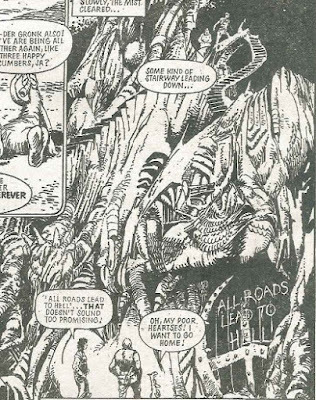 Just thinking about those ancient Eurovisions puts a smile on my face, but I should turn my attention to the comic book. 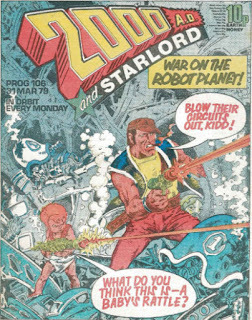 The cover this week features my least favorite story, both then and now, Robo-Hunter. It was illustrated by Ian Gibson, starred Sam Slade, a cigar-smoking bounty hunter of robots. The series was noted for its attempt at a humorous tone. In the story, Slade is dispatched to a distant colony planet to solve the mystery of its vanished colonists. 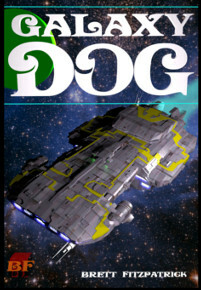 An act of sabotage on his space craft causes time dilation during the trip, meaning that Slade arrives at the planet restored to his early 20s while the ship's pilot, Kidd, is now a cynical talking baby. I’m no fan of Robo-Hunter, as I said, but I have to admit that Gibson is a superb draftsman and he can create an image that has detail and real dynamism. 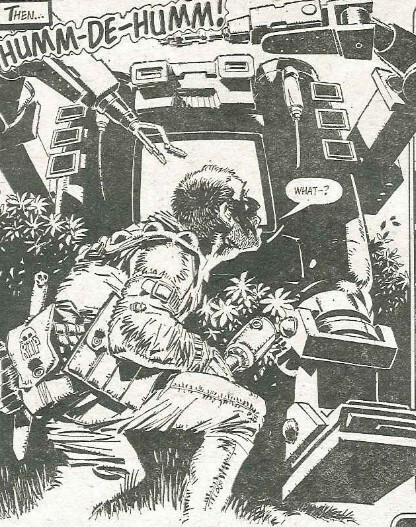 It shows Sam and his weird, baby, sidekick in a firefight on the robot planet. Judge Dredd is the first strip, and Dredd finally uncovers why all the other judges are loyal to Chief Judge Cal, it’s because of subliminal messages in the crime reports that they listen to, like fake news. 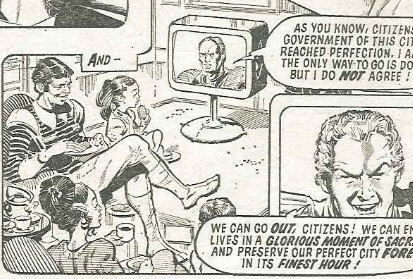 I have mentioned the parallels between the braggadocios and insane Judge Cal, ruler of Mega City One, and present day Donald Trump many times. In this issue Cal is building a wall and creating support for himself with fake news. The politics of the strip are quite prophetic. In other ways, however, it is very much rooted in the 1970s. We see citizens of the future city in one frame, but endearingly their home looks like something from the 70s, not the far future. We see a nuclear family clustered round the TV, all watching the news together. Next we have Robo-Hunter, which is its usual, forgettable bunch of garbage. 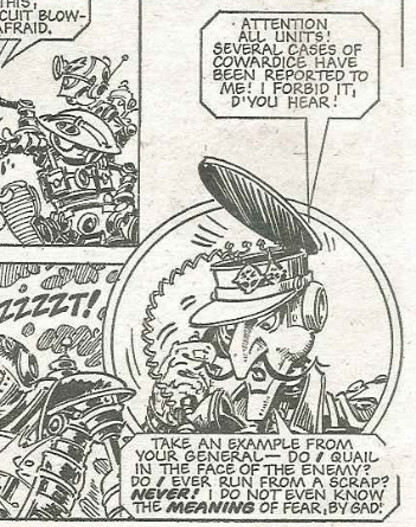 It even has a robot general answering a phone that pops out of his robot hat. It’s all a bit dumb and crazy. However, the last panel is very well drawn. I remember it to this day from way back then. I remember trying to draw a copy of it, and failing miserably. Next comes Strontium Dog and the story starts to get going as the bad guy disappears through a dimensional warp. Johnny Alpha follows him through and, in an audacious bit of storytelling, comes out the other side in, no fooling, honest to goodness, hell. 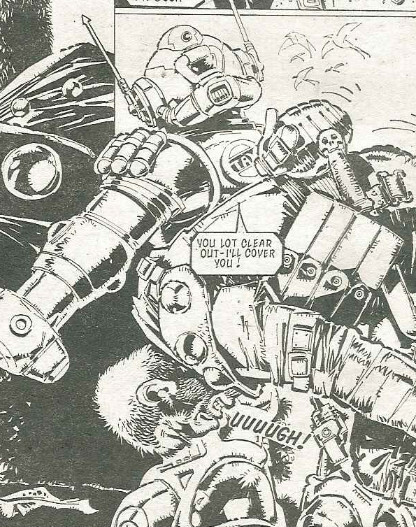 It is all drawn by Carlos Ezquerra, and looks great. All we see at the end of this week’s episode is the doors of hell, but they will be going through in the very next episode. Then comes Dan Dare, with wonderful art, though the actual plot of this week’s episode doesn’t amount to much more than messing about on the river. 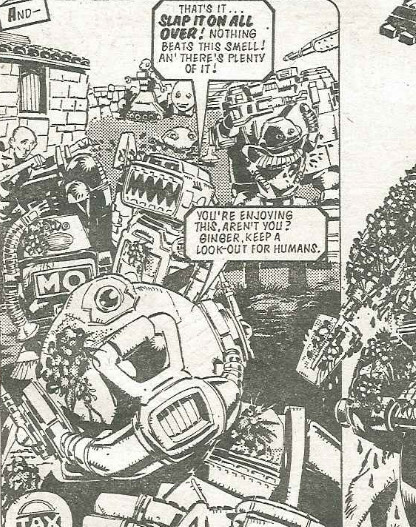 And then comes Ro-Busters, with the delightfully thuggish Robot Interrogation Police, drawn by Mike McMahon. It seems like the robot investigation police have picked on the wrong bunch of robots. They have certainly bitten off more than they can chew with Hammerstein, the war robot with a hammer for a hand. Heavily armed as they are, they are no match. There is a lot of cathartic fun, as Hammerstein single-handedly kicks the asses of the gang of fascist, paramilitary police thugs, that is until one of them decides to pull the pin on a grenade. Hammerstein hasn’t seen him in the bushes, and it seems that he is in big trouble. Luckily the mad doctor robot spots him, and does some surgery. It is nice, bloodthirsty stuff, and I lapped it up as a kid. The Robot Investigation Police (The R.I.P.) just keep coming, though, as there is a very hostile environment for robots in the future UK. The R.I.P. 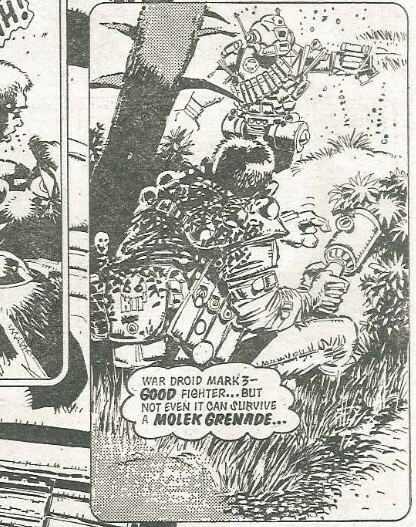 are on the robots’ tail with a robot detector and they have to disguise their droid smell. They do this by smearing themselves in the much from the bottom of a pig stall on a farm. 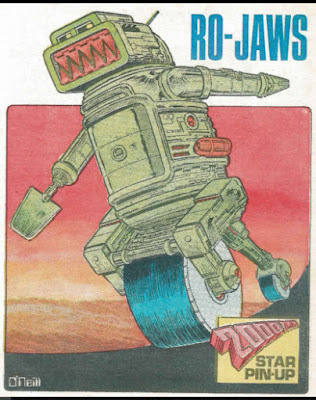 This is something that the garbage robot, Ro-Jaws, really enjoys. 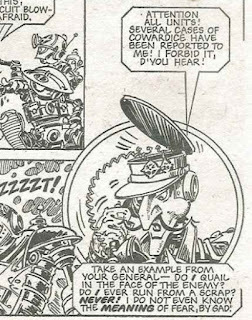 Hammerstein, the neat and tidy ex-warrior, however, hates it, and these moments of characterization among this gang of renegade robots are great. 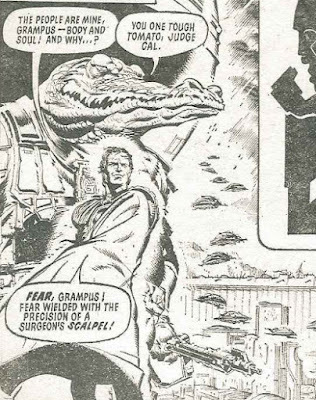 The last page of the comic book is another picture of Ro-Jaws. 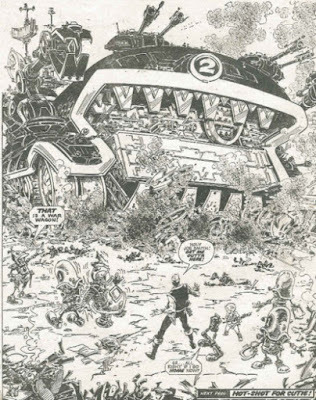 This time we see a shiny and new version drawn by Kevin O’Neil, rather than the pig muck smeared old version drawn by Mike McMahon in the comic book. And I actually prefer the latter, even though the back cover poster is very nice.